Signing off. And on. And, of course reflections regarding said signing. This blog hasn't been updated in a while. The explanation for that is simple - I locked myself out from internet and photography to manage school for a while. Basically, I slipped behind five weeks or so due to flu, and had to catch up. It's all right - I'm done. But this blog still won't be updated anymore. Yes, that's right. 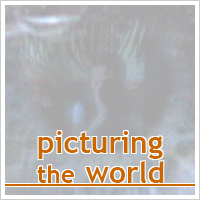 I'm officially abandoning Picturing the World. THIS version. You heard me. I recently acquired the domain linusbohman.se (.se is the swedish extension) and some web space, and switched Picturing the World to blog.linusbohman.se. It's on Wordpress now, a lot more powerful platform. There's still some kinks to be worked out, but I'm on my way. I'd be grateful if you updated any eventual bookmarks and links, and gave me any feedback you might have. One of the first pictures I uploaded was "If I was a ghost, would I see things differently?" It means a lot to me, since it is my first (and so far best) self-portrait. Over the year, a series of picture has started to emerge in my collection. On the flip side consists of five photos thus far (1, 2, 3, 4, 5), and is a way for me to show how special the world is. If just a simple rotation can so fundamentally alter our perception of a building, then every day should be a new exploration. I also enjoyed shooting "Breaking the Barrier" with my younger brother. He was an excellent model - playing with the plastic, suggesting angles and lighting, and most of all having plain fun. You'll probably see him again. And, to make it quick and sum it up, here's a quick list of some of my other favourites. As said, feel free to scan through the archives for more. A big thanks to all of you for doing this journey with me. I hope I'll see you on the next page as well, where the pictures will be even better. Again, thank you.